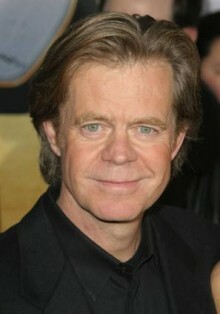 Oscar nominee and Emmy and SAG Award winner William H. Macy is one of the most distinguished talents of his generation. In the upcoming months, Macy continues to demonstrate his versatility in several diverse roles, adding to his already impressive credits. Macy received outstanding critical acclaim for his role as Bill Porter in TNT’s Door to Door, opposite Kyra Sedgwick, Helen Mirren, Kathy Baker and Felicity Huffman. The movie, which Macy also co-wrote, tells the true story of Porter, an award-winning door-to-door salesman with cerebral palsy. The movie aired to unprecedented ratings for a TNT original movie premiere and received a SAG Award, Peabody Award, an AFI Award, a Critic’s Choice Award, a Golden Satellite Award, a Writer’s Guild nomination, an American Cinema Editors nomination and a Golden Globe nomination. The movie was nominated for 12 Emmys and won 6 including Outstanding Made for Television Movie as well as winning Macy the Outstanding Lead Actor in a Television Movie statue and Outstanding Writing for a Television Movie with Steven Schachter. Macy was recently seen in the critically acclaimed romantic drama The Cooler. The supporting cast includes Alec Baldwin, Maria Bello, Shawn Hatosy, and Ron Livingston. Macy also stole scenes in, Seabiscuit, the American epic of triumph and perseverance set during the Great Depression. The film stars Tobey Maguire, Chris Cooper and Jeff Bridges as three men – a jockey, a trainer and a businessman – and the down-and-out racehorse that took them and the entire nation on the ride of a lifetime. Macy was nominated for a Golden Globe for his role as Tick Tock McLaughlin and the movie was nominated for Best Picture for both the Golden Globes and the Oscars. In the Spring, Macy will be seen in the Showtime Original Picture Stealing Sinatra, which depicts the 1963 botched kidnapping of Frank Sinatra, Jr. Directed by Ron Underwood, Macy stars as John Irwin, one of three kidnappers who abducted Frank Sinatra, Jr. from his hotel at gunpoint just before a show in Lake Tahoe. David Arquette also stars. In May 2004 Macy was seen in the CBS mini-series Reversible Errors, based on author Scott Turow’s best-selling legal thriller. Macy plays Arthur Raven, a corporate lawyer who reluctantly takes a pro bono 10-year-old triple-murder case after being appointed by the court to handle the last-minute appeal of the convicted killer. Tom Selleck and Felicity Huffman also star. In 2004 Macy will also be seen in two independent features: In Enemy Hands for director Tony Giglio follows the crew of the U.S.S. Swordfish during the height of Hitler’s infamous U-boat war, and Cellular starring opposite Kim Basinger. Basinger’s character is kidnapped and her only hope is the small cellular phone she holds. She calls for help and connects with a teenager who teams with Macy’s character to rescue her in the midst of a police conspiracy. Macy rejoined writing partner Steven Schachter for a new take on the 1962 comedy Gigot, which originally starred Jackie Gleason and was directed by Gene Kelly. Currently titled The Wool Cap Macy and Schachter wrote the script and Schachter will direct. Production is scheduled to begin in February. The film will follow the heartwarming story of the janitor Gigot who befriends the little daughter of a prostitute. They are also teaming up on a project for Showtime. Tentatively titled The Accountant and the Stripper the movie is based on the true story of a Florida accountant appointed by a judge to run a string of local strip clubs. Macy will play the certified public accountant Lew Berman, Macy and Schachter will write the script and Schachter will direct. Macy is best known for his portrayal of Jerry Lundergaard in Fargo, for which he received an Oscar Nomination and won an Independent Spirit Award as Best Supporting Actor. He also garnered nominations for Funniest Supporting Actor in a Motion Picture (American Comedy Awards), Best Actor (Chicago Film Critics), Best Supporting Actor (Dallas/ Fort Worth Film Critics), and Best Actor in a Drama (International Press Academy). Macy’s distinguished film credits include Magnolia, Pleasantville, Happy Texas, State and Main, Jurassic Park 3, Focus, Welcome to Collinwood, Psycho, A Civil Action, Boogie Nights, Wag The Dog, Air Force One, Ghosts of Mississippi, Mr. Holland’s Opus, The Client, Shadows and Fog, Murder in the First, Searching for Bobby Fischer, Radio Days and Panic. In the realm of Television, Macy has been no less prolific. He received an Emmy Nomination as Best Guest Actor in a Drama Series for his recurring role as ‘Dr. David Morgenstern’ on ER. Macy also had a recurring role on Aaron Sorkin’s Sports Night and was nominated for an Emmy for his performance. His movie of the week credits include A Murderous Affair, Heart of Justice, Standoff at Marion, Andersonville and the miniseries’ The Murder of Mary Phagan and The Awakening Land. In addition to the politically charged BBC telefilm The Writing on the Wall, Macy also appeared in two David Mamet vehicles, The Water Engine and Showtime’s Texan. In 1999, he starred opposite his wife Felicity Huffman, on the TNT television film A Slight Case of Murder and received another Emmy nomination. Macy and his writing partner Steven Schachter wrote the film and Schachter directed. Also with Schachter, Macy has written several television scripts, including an episode of Thirtysomething, the HBO movie Above Suspicion and the USA Networks movie The Con starring Macy and Rebecca DeMornay. Most recently, Macy was seen on the small screen in a regular guest role in the Showtime original series Out of Order, also starring Eric Stoltz, Felicity Huffman, Kim Dickens and Justine Bateman. Born in Miami, Macy lived in Georgia until age ten before moving to Cumberland, Maryland, where his love for acting spawned as Mordred in Camelot. Elected junior and senior high school class president, he set out to become a veterinarian at Bethany College in West Virginia, but after performing in “play after play” Macy transferred to Goddard College in Vermont, where he came under the tutelage of theater Professor David Mamet. In 1972, Mamet, Macy and his writing partner Steven Schachter moved to Chicago, where they collectively created the St. Nicholas Theater. Macy originated roles for several of Mamet’s classic original productions, among them, Bobby in American Buffalo, and Lang in The Water Engine, soon establishing his feature film presence with writer/director Mamet. He continued with Mamet as a Mafioso driver in Things Change, a Marine in House of Games and an FBI agent in Wag the Dog. Moving to New York in 1980, he continued to build his reputation in the theater as an originator of new roles, in such off-Broadway productions as Baby With the Bathwater, The Dining Room (later filmed for PBS – “Great Performances”) Life During Wartime, Mr. Gogol and Mr. Preen, Bodies, Rest and Motion, and Mamet’s Prarie du Chen, Oh Hell, and Oleanna. His stage credits, approaching fifty during his ten years in New York, also include the Broadway production of Our Town, Tony Award winner for Best Ensemble. Macy was also seen on the London stage in the spring of 2000, where he co-starred in the revival of David Mamet’s American Buffalo at the Donmar Warehouse. Following the run in London, the play moved to the Atlantic Theater Company in New York for a record breaking run. Along with his acting career, Macy has also earned respect as a teacher and director. Having led theater classes in Chicago and at New York University, today he serves as director in the residence at the Atlantic Theater company in New York. His extensive directing resume includes Boy’s Life at Lincoln Center, the LA production of Oleanna at the Tiffany Theater, as well as Lip Service, an HBO film which won an ACE Award for best Theatrical Production. Most recently, Macy directed the play The Joy of Going Somewhere Definite at the Atlantic Theater Company in New York. In 1998, Macy was honored by Showest when he was named Best Supporting Actor of the Year for his body of work. Macy is married to Emmy nominated actress Felicity Huffman, who starred on the critically acclaimed series Sports Night. They live in Los Angeles with their two daughters. Do you want to hire William H. Macy? Directly request a quote. In 48 hours we can send you the availability of William H. Macy If you would like to book William H. Macy, Entertainment Booking Agency is the right place. We will offer you the best price and contact the management or we directly contact William H. Macy. For corporate appearances or speaking engagements you can contact our agents and the will help you true the process. Tags: hire William H. Macy, William H. Macy booking, book William H. Macy, William H. Macy appearances, find more information on booking William H. Macy for appearances, William H. Macy speaking engagements, William H. Macy endorsements/spokesperson, William H. Macy appearance fees, William H. Macy booking agency contact info, biography of William H. Macy, Contact an artist booking talent agent find a speakers bureau that can book William H. Macy, speaker booking agency for William H. Macy, William H. Macy booking agency, William H. Macy booking for corporate event. EBA is one of the biggest entertainment booking agencies in the World. We book hundreds of celebrities, artist, athletes and speakers in a year. Important to know is that we are not claiming to be the management of William H. Macy. We are not the official agent for William H. Macy. Companies from around the globe book these artists and speakers true our company be course we have one of the biggest networks and we always have direct contact with the artist or the management. We help you to find the right celebrities for your corporate of private events. Please contact one of our agents to get free advice and we will help to get the world-famous artist on your party.